The year 2012 finds Danny Fast Fingers living in Austin, Texas and promoting his latest album "Two Angels" . Recorded at The Zone in Dripping Springs, and coproduced with Oklahoma Music Hall of Famer, Jamie Oldaker ,Danny uses his multi-instrumental abilities to the max utilizing acoustic, electric 12 string guitars, organ, pedal steel, bass, banjo and electric sitar. Jamie lent his many years of experience to the sessions laying down a solid foundation on drums and percussion. In the past, Jamie has worked with stellar musicians including Eric Clapton, Bob Seger, and Ace Frehle and The Tractors. Danny is also joined on these recordings with his bass player for the past 3 years Debra Parr. They perform live as a duo and also as a trio with drummer David Hisky. The past 3 years have found them playing in many venues in the Austin area. At the age of 8 a desire to learn how to play guitar led to three years of guitar lessons, studying Mel Bay method books and The Monkees greatest hits. First fret barre chords on a 1968 Harmony Acoustic led to a cessation of lessons. Listening to Cream's Disraeli Gears, Led Zeppelin II, the Woodstock album and 45's from his older brothers record collection opened his ears to various styles of rock music. Spanish 102 college final at Boston University led to his picking up guitar to accompany a fellow classmate's rendition of Spanish folk songs. It was a rediscovery of his love for the guitar that has led to non stop playing since 1977. He spent many hours practicing scales, arpeggios and chords and learning songs from records. A summer semester at Berklee College of Music in 1979 opened up his ears and eyes to the requirements of being a proficient player. He's been writing songs since 1979 and has recorded independent vinyl and cd's since then. Danny found himself in a string of bands in the early 80's starting with The Rayons, Dissidents, The Touch, Kaminsrock, and evolved as a multi-instrumentalist adding bass, synthesizers, drum machine, saxophone to his arsenal. A 7" 45 entitled "Kool Aid and Cyanide"/"To Be Inside You" independantyl released in 1981 under the name DISSIDENTS showed his influence of 60's garage/punk/powerpop, balancing his themes of social criticism along with romantic love songs. 1986 found Danny exploring the techno pop genre in the project Danish Sky with the "Attack of the Killer Robots" 12 inch single and accompanying video which received widespread play nationally on college radio and dance clubs. It was innovative combining acoustic guitar with heavy drum machine beats. The video charted on ROCKAMERICA as a top 10 video. All the while maintaining his solo performer roots, Danny played a string of 17 shows at the famous CBGB Canteen in the late 80's and early 90's. Danny worked at Unique Recording in NYC in from 1988 to 1989 and second assisted on many recording sessions including Nine Inch Nails, Tackhead, Donny Wahlberg, and Steve Arrington. 2 yearsof living in Northern California beginning in 1992 brought Danny back to his "folk" roots and his release "Mad River" showcased his barebones guitar and vocal arrangements which was received with high acclaim in Humboldt County. A return to New York in 1994 found him continuing his solo career in East Village hot spots. An interest in sitar evolved into guest performances on friend's recording sessions. Collections of songs were his goal and he has many released and unreleased projects. 1998's Songs For Milton was recorded on a 4 track Portastudio at home and holds up to this day as an organic 18 song collection straight from the studio in the basement of his parent's house in New York. Danny released his CD "Sitardelik" in 2001. It showcased his sitar playing blended with electronically looped backbeats. He has recorded 2 other cd's since moving to Austin in August 2006. iDanny was recorded in 2006 at Top Hat Recording with the rhythm section of Gene Kurtz and Herb Belofsky both formerly of Dale Watson's band. Snake Head Red was recorded in 2008 at Flash Point Recording. The 21st Century has brought Danny's songwriting to a new level. His forte continues to be clever lyrics combined with memorable melodies. His rhythmic strumming style on 12 string gets an audience tapping on their feet. Since moving to Austin he has broadened his music influences and absorbed the many styles of Texas music into his own. Growing up in the 60's has had a profound effect on his music and Danny counts the Beatles as a main influence as well as Bob Dylan and Neil Young. In addition, garage, surf, and bubble gum rock find their way into his songwriting styles. Danny is a fan of many styles of music from around the world ranging from Indian to Jamaican to Country/Western. He counts Ravi Shankar, Augustus Pablo, Buck Owens, Tommy James, and Sly Stone among his influences. Danny was the creator of the innovative Fast Fingers Music Software MIDI Keyboard Lessons first published in 1984. This software was one of the earliest Music Education software products to be marketed nationally and was featured in Electronic Musician magazine. 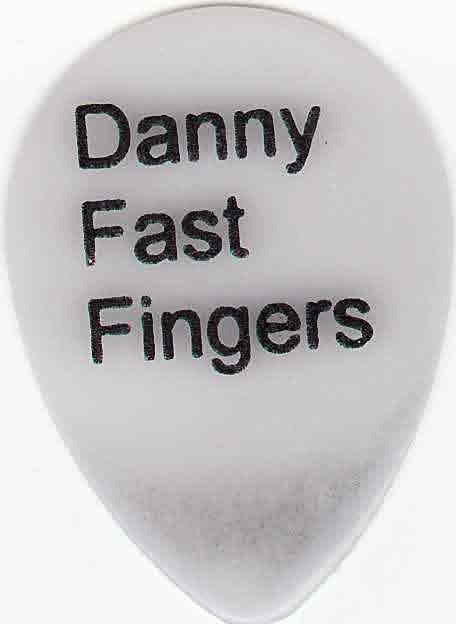 Danny Fast Fingers continues to grow as a songwriter, musician and performer and is poised for further recognition in and beyond Austin, Texas.